The Netherlands; Late 15th Century. Latin Text; Angular Gothic Script. 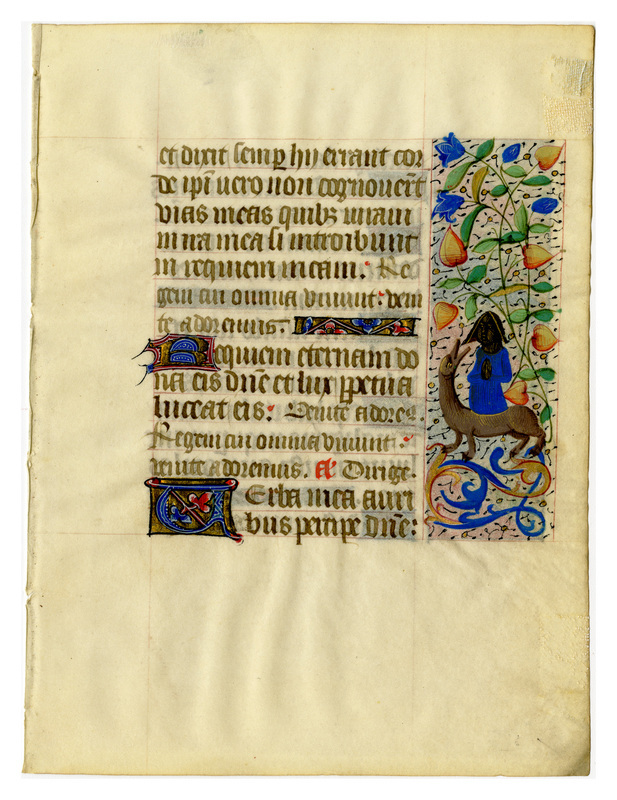 In assigning this leaf from a Book of Hours to the Netherlands it must be remembered that some sections of that country were once part of France, while others belonged to what is now Germany. In this leaf French characteristics predominate, but in no other country did the study of nature have a more direct influence on miniatures and ornamentations that in the Netherlands. Carnations, pansies, columbines, and many other flowers were faultlessly and realistically drawn. A few decades later, at the turn of the century, cast shadows as well as snails, butterflies, and birds were added, with the result that the borders became a distraction to the reader. The borders on these leaves come in two forms. Some are composed of a firmly-defined rectangle filled to its edge with solid color (dominated by cinnamon, deep sky blue, and gold) rendered in a decorative conceit (triangles, waves, bars) and framing simple flower sprigs. Other borders are less boldly outlined and are not filled with solid colors; instead, a speckled background hosts a strong acanthus vine and a wildflower spray in which a live creature (a bird, a human, a zoomorph) may lurk. While this leaf may have been created in the Netherlands, its rubricated headings are in French. Text: This leaf contains the introductory section of the Office for the Dead at Matins. Eternal rest give unto them O Lord: and let perpetual light shine unto them. Come let us adore. The King, unto whom all things do live, Come let us adore. Ant. Direct. Verso Translation: [from Psalm 94] For the sea is his, and he made it: and his hands founded the dry land: come let us adore, and fall down before God: let us weep before our Lord, that made us: because he is the Lord our God: we are his people, and the sheep of his pasture. Hail Mary, full of grace: our Lord is with thee. et dixi, semper hii errant corde: ipsi vero non cognoverunt vias meas: quibus iuravi in ira mea, si introibunt in requiem meam. Regem, cui omnia vivunt, Venite Adoremus. Requiem eternam dona eis Domine: et lux perpetua luceat eis. Venite adoremus. Regem, cui omnia vivunt, Venite adoremus. Ant. Dirige. Verso Transcription: Quoniam ipsius est mare, et ipse fecit illud: et aridam fundaverunt manus eius: venite adoremus, et procidamus ante Deum: ploremus coram Domino, qui fecit nos: quia ipse est Dominus Deus noster:nos autem populus eius, et oves pascuae eius. 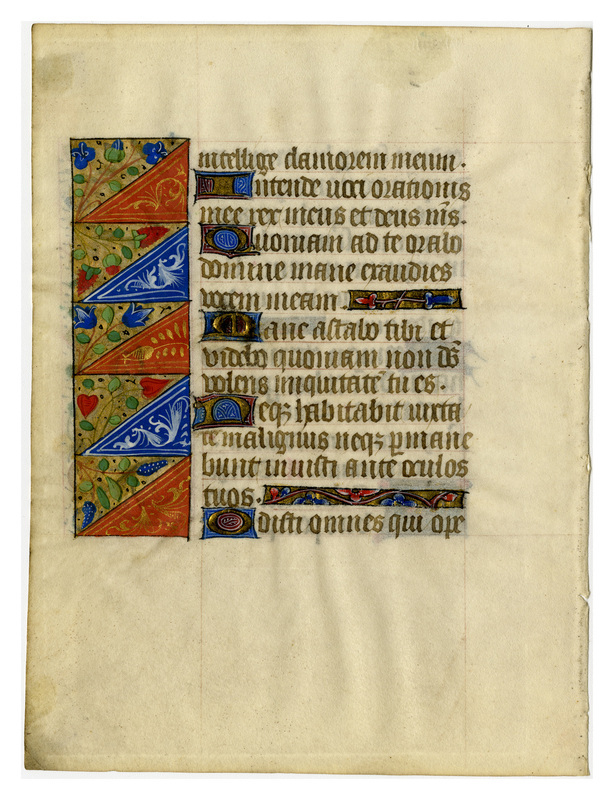 “E0047 Leaf from a Book of Hours (Horæ Beatæ Mariæ Virginis),” Digital Exhibits | Denison University Archives & Special Collections, accessed April 23, 2019, http://exhibits.denisonarchives.org/items/show/67.